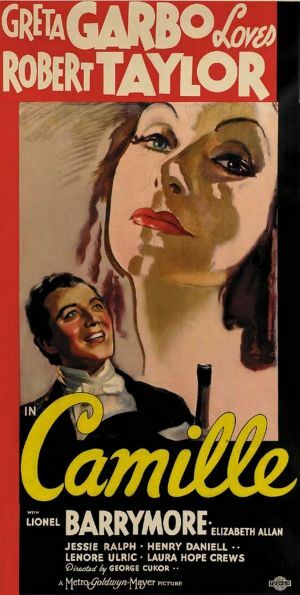 The 1937 release of Camille did not give audiences a new story. The romance originated as an Alexandre Dumas novel that became a Paris play in 1848, the Verdi opera La Traviata, a 1907 Danish short film La Dame aux Camlias, a 1915 Shubert production, a 1917 Fox film, and a 1927 First National production, among many others. What the other adaptations did not have, however, was Greta Garbo. Although the past productions also featured some great actresses in the lead role, for audiences in the 1930s, there was no better-suited star than Garbo. She plays Marguerite Gautier –the lady of the camellias because of her love of the flower– who in this film’s case is a society lady whose lifestyle is paid for by the generosity of male suitors. With her debt on the rise, Marguerite is advised by a friend, Prudence Duvernoy (Laura Hope Crews), to find a wealthy suitor. The mark is the Baron de Varville (Henry Daniell), but a case of mistaken identity at the theatre lands Marguerite in acquaintance with long-time admirer Armand Duval (Robert Taylor). Although Marguerite carries on a relationship with the Baron, and he keeps her financially sound, she finds herself all at once in love with Armand when the two are alone at a party. She has also been hearing that this man over the years has always been ever attentive when she would fall under one of her illness spells, likely the result of tuberculosis. After some time and growing affection, Marguerite agrees to break off her relationship with the baron in order to spend a summer in the country with Armand, something that would perhaps mend her health. Before she can leave town, however, she must pay off $40,000 francs worth of debt, something no match for Armand’s $7,000 per year salary. The baron foots the bill just before declaring he would never see Marguerite again. The couple have a marvelous time in the country despite the discovery that the baron’s mansion is just a hill away. While there, however, Armand’s father (Lionel Barrymore) stops by to beg Marguerite to back off. He says the relationship will ruin the young man’s future success and could bring a certain amount of shame upon him. Marguerite, despite knowing that her health is unlikely to keep her around for many more years, coldly breaks her relationship with Armand and says she is returning to the nearby baron. The couple will reunite, but not under happy circumstances. I cannot help but ponder why the story of Camille has time and time again produced movies –as recently as the 2001 Moulin Rouge. The story is that of a love triangle but not one in which the object of the dual affection is emotionally torn between two individuals. Instead, she must weigh passion against her financial needs, needs that have been ever-present in her past up until the introduction of true love. Other incarnations of Camille have painted the woman as a courtesan, and although the Garbo version does not depict her that way ala Production Code restrictions, there is no denying her source of income. So the story also involves a love so strong that it ignores the woman’s seedy past. Perhaps the plot is appealing to viewers because the romantic choice is obvious; we will always root for love over money. Yet regardless of the decision, the woman will still meet a fate that neither love nor money could have prevented. Garbo and Taylor embody all that the story demands of impassioned love. Although Garbo’s performances can be cold at times, she is convincing in her emotional connection with Taylor, who meanwhile is exhibiting the endearingly obsessive love that seems to exist only in films and classic literature. The couple does the story justice and create a good entre for anyone who has yet to be exposed to the classic romance. It is possible that still to this day I would not have seen Ninotchka had it not been for its appearance on one of those lists of the best movies ever made or movies you have to see. I bought it as part of a Greta Garbo box set some time before that list crossed my path, a box set that seven years later still has several untouched DVDs. But I am lucky/glad the circumstances led me where they did because Ninotchka truly is one of the best pictures ever made. This Best Picture/Writing/Actress–nominated movie will play at noon ET Saturday as part of TCM’s 31 Days of Oscar. It might not have won in that oh-so-competitive year of 1939, but it has maintained a place in cinema history nevertheless. The tag line for the Ninotchka promotions was “Garbo laughs” because it was one of the few lighter roles she did in sound. When you start into the movie, however, you will be befuddled by that reference because as this Russian officer Ninotchka, Garbo fails to smile for the front third of the flick. The Swedish star plays the heavy who enters France to find out what is taking three bumbling Russian officials so long in selling some royal jewels. These Iranoff (Sig Rumann), Buljanoff (Felix Bressart), and Kopalski (Alexander Granach) have discovered the wonders of a capitalistic society and all the luxuries it offers and are in no hurry to return home. 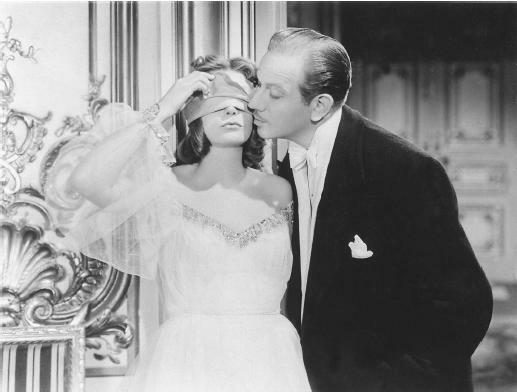 Ninotchka will resist the lure of the romantic and decadent city of Paris even when she finds the kisses of Leon, played by Melvyn Douglas, delightful. It is an absurd hat that will turn her, however, and when she breaks down into laughter, we know Mother Russia’s spell has been lifted. Ninotchka almost seems scandalous in how heavily Garbo’s character pushes the message of the evils of capitalism and the glory of communist Russia. One can forget all that, however, when the leading lady starts living life to our own delight. Garbo is so charming as the naive adult entering such a luscious society, but she also plays the brutally stoic role perfectly. Douglas, meanwhile, could not be more charming. I feel like as an actor he largely failed to make his mark or distinguish himself from the mass of similar leading men, but he really is swoon-worthy here. I find the duo particularly enthralling in a late-night scene in Leon’s apartment after “little father” the butler has been sent home. Garbo’s growling of “again” as a request for another kiss is hilarious, endearing and unexpected all at once. And if you have never heard of Ninotchka and the title has you bewildered in terms of pronunciation, no worries. By the end of the picture you too will be shouting “Ninotchka, Ninotchka, Ninotchka!” and possibly asking your significant other to “salute”. It might be worth noting on a down point that Ninotchka was remade into the 1957 musical Silk Stockings with Fred Astaire and Cyd Charisse. My first disappointment with that film is that it did not actually feature the jazz standard “Silk Stockings”. Secondly, it is a tragic disappointment story and performance-wise when compared with its origin movie.